Marketing gurus of real estate marketing are always debating which type of marketing materials is the most effective way to reach target audience: paid online ads, social media, real estate newsletters, flyers and marketing postcards, email newsletters, interactive website or such a relic as cold-calling? There is no short answer – and in reality, you probably will need to use a combination of several of these marketing methods in order to reach your selected target audience. They all work for different types of clientele, accomplish a multitude of marketing goals and deliver your message that is most suitable for the media you have chosen for a specific campaign. Let’s compare real estate newsletters, one of the most traditional tools of real estate agents, to other marketing materials and determine strong sides and shortcomings. Any newsletter needs content and it can be time-consuming to write it yourself. So many real estate agents opt for a professional real estate newsletters company that provides relevant materials month after month with zero effort from agents after initial setup. Though it seems like an efficient use of your time (concentrate on selling while leaving marketing to professionals) the pitfall in such arrangement may be newsletters content that is not relevant for your particular market. As we all know, real estate is local and while national statistics may paint an average picture, you need market update specific to your area. Taking this into consideration, the best real estate newsletters can be the ones that allow you to customize content with graphs, statistics, sales and even featured listings. It gives your clients an impression that you are a competent specialist who knows the market and your newsletters give them news they can use. Don’t overdo the message: newsletter should be interesting to read, provide some general interest information and even recipes. If you push ‘list, sell, buy, move, refinance’ too hard it will distant and irritate your clients, even those who are ready to make a move. On the other hand, strategic long-time newsletter campaign will make you a friendly neighborhood specialist who is there on a consistent basis. In that case, you are likely to be their first choice when they are ready to buy, sell or refinance. 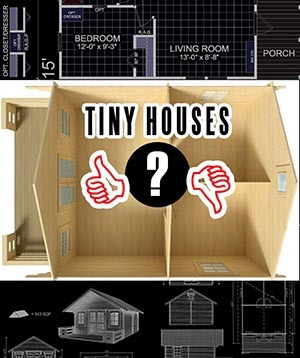 That is why most successful Realtors include in their newsletters neighborhood classified ads, information about neighborhood garage sales that they’ve sponsored, team sporting events, birth announcements, boys & girls scout announcements, pet photo contests and even funny cartoons and real estate humor. Your real estate newsletters need to have that delicate balance of helpful information and fun facts that help build-up community ties and make you a trusted advisor in the process. Though mailing newsletters may seem like a wise choice, hand-delivering them to your targeted neighborhood will most likely help you establish friendly relationships that will pay tri-fold over the years. Even if you are busy handling transactions and prefer to mail your newsletters, leave some to hand-deliver and rotate these areas. You can even start an exercise club for stay-at-home moms and hire them to be your helpers in delivering your real estate newsletters to their neighbors and friends or hire responsible teenagers to make extra money – their parents will be thankful! Most of the real estate newsletters companies that you see on the market offer four-page full-color publications that are expensive to print and mail. Keep in mind that some of your environmentally-conscious consumers may object to such use of our natural resources. So always provide an option to read your newsletter online (via a QR code printed on the back or sent via email) and give your clients clear instructions how to opt-out of a paper version of your real estate newsletters. Pick companies that are using recycled materials for printing and encourage your clients to recycle and reuse—and in doing so pass your newsletters to their friends and family. Remember that your main goal is to keep your face in front of your clients, not fill up their paper recycle bin. 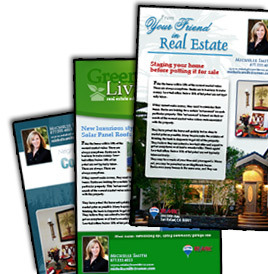 For this purpose, smaller real estate newsletters – the size of a large folded greeting card can be an answer. It is cheaper to produce and mail but may be more efficient in delivering your message. You want your professional information and marketing pitch to be delivered instantly, without an extra effort of unfolding a lengthy publication, that requires time your clients may not have at the end of the busy day. That’s why real estate newsletters for clients maybe not as efficient as calendars, magnets or notepads—they have a short shelf life unless you occasionally provide information that is worth to be cut out and put on the refrigerator for future reference, along with your phone number. Most seasoned real estate agents rotate marketing materials they use: calendars in December, notepads with a hand-written personal message for Thanksgiving, postcards for the 4th of July and marketing newsletters full of useful information the rest of the year. The other valid point to consider is that though you should be on the edge of technology with iPad, smartphone and interactive weblog, your older clients (the ones that have the equity in their homes) may not be and would prefer to read professionally designed printed real estate newsletters for clients that are easier on their eyes. Thinking about your clients’ preferences and preferred media for your targeted audience is always a winning strategy when evaluating real estate marketing ideas and is worth a separate discussion. Real estate newsletters for clients need fresh content for each new issue while designing postcards or picking from available templates for a relevant message is less time-consuming (postcards need just 1 – 2 photos, logo and a headline). Printing and mailing a full-color a newsletter on a quality paper is expensive so cost-efficient alternatives may be worth considering. Real estate newsletters are mailed folded with content and featured listings hidden inside while postcard is always “open” and delivers the message instantly. Pick newsletter design that utilizes the best of a postcard. Only a few people have time to read articles inside your newsletters. Postcards have much shorter but “to the point” message that reaches clients right away. Provide options for the delivery of your real estate newsletters such as e-newsletter and web blog. Real estate newsletters cost more to mail comparing to postcards – be creative and involve your community to help you deliver your message while building professional ties with your clientele.